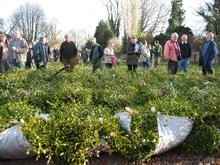 The first of this year’s mistletoe auctions in Tenbury Wells – the crowds are out in force as usual – and I spend 30 minutes just trying to park. The Auction Yard – now under the ownership and management of William Chase (best known for Tyrrells Potato Chips [don’t call them crisps]) has been revamped a bit – and the stock is laid out at the back of the site. Tyrrells are a main sponsor of this year’s Mistletoe Festival and we are very grateful to them. 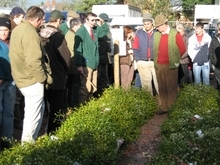 The auctions themselves are managed by Nick Champion – who has been mistletoe auctioneer for many years. 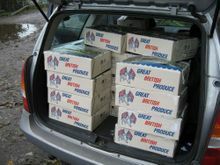 And what a lot of stock there is – loads of mistletoe, and all very-heavily berried (despite the scare-stories of the News of the World a few weeks ago – and just as I, and anyone else who looked, predicted!). There are the usual camera and film crews about – including all the local press – Worcester Journal, Shropshire Star etc and a video crew. There’ll probably be more next week – we’ve got the druids coming then. And here’s the start of the mistletoe action – with Nick Champion (with the headset, shades and stick) preparing to auction the first mistletoe lot of the day. These auctions move fast – with the stock removed within minutes of being sold, to be bundled into waiting wholesaler’s vans and lorries in the yard. With the glut of mistletoe prices are low – Nick Champion was reported afterwards as saying "Normally we would expect in the region of 700 – 800 entries at this first sale… this year we received 1,100 lots." 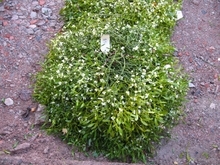 Quality mistletoe was selling at 50p – 70p per pound – about half what it makes in some years. You can read newspaper reports here (Hereford Times) and here (London Metro). The video crew are a local unit from Hazelwood Video, haeded by producer Paul Bye. 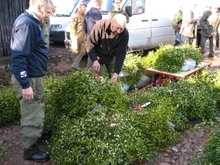 They are making a video about the River Teme, with most of the filming next year, but wanted to cover the Tenbury mistletoe events now. They film at the auction and then we go out of town to a local mistletoe-filled orchard to film a session with me talking about mistletoe. You can Paul’s range of work on his website, and read an interview with him (and see a ‘high-speed trip’ down the Severn) here. Meanwhile, at the Festival venue just at the auction entrance, I see we have a lot of visitors from out of town – identifiable when they ask for directions to the auction! Monday 27th November – and a trip to London for a meeting about Orchards with Sustain: ‘the alliance for better food and farming’ to discuss the national Leader+ funded (an EU-fund) orchards project. This is a 2 year project – which, after a few hiccups on the match funding, is now well-underway. The meeting was a chance for reps from various orchard and fruit groups to get together and chat, and hear updates from the 4 local orchard projects funded by Leader+. I’m not going to list those in detail here – but if you’re interested they are Damsons in Cumbria, theatre/community apple pressing in Devon, innovative ways to assess true economic value of orchards in Herefordshire and an Orchards for Everyone project in Kent. You can find an overview at Sustain’s Orchard Project website. Saturday 25th November – and the Tenbury Wells Mistletoe Festival 2006 has now begun – the Christmas lights were turned on yesterday followed by the 1930s dinner-dance event. So what’s in the Saturday papers about it? Not a lot in most, though there is a quarter-page in the Daily Telegraph, majoring on the threats to the mistletoe auction site. This is the piece that I mentioned a few weeks ago – with the photographer in the orchard – but as so often happens in the press they haven’t used any of those pics – just recycled some from last year. But the main pic is of the Druids – who make a striking picture – so can’t really blame the picture desk. There is some disappointment in the Festival committe that the article didn’t mention more about the Festival events – but this is the main pages of the Telegraph – the concerts etc are less appealing to the editor of this than the threats to the mistletoe auction. Events coverage will be more likely in the local papers. A few national magazines have taken it up through – Saga magazine’s December issue covers the Mistletoe Festival events rather well – including a photo feature on their website. Sunday 26th November. No further media on the Festival yet – but TEME online mistletoe shop gets a plug in the Sunday Times online shopping pages. 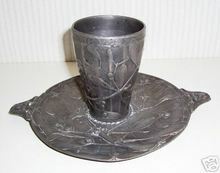 I�ve just taken delivery of a pewter beaker and saucer, with mistletoe motif on both. They�ve come, via Ebay, from France. I�ve seen similar items before, but this is the first I�ve actually handled. But what are they? What is this strange object for? Some beakers (probably more accurately ‘tellers’) I�ve seen like this are German, and I assumed this one was too, as the vendor described illegible lettering around the mug rim as �German�. So I was surprised to find that this lettering (not at all illegible!) 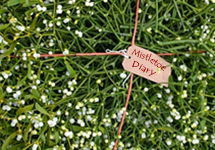 is French � and simply states �Au Gui L�An Nouveau� a variant on the usual �Au Gui L�An Neuf� � the traditional French �Mistletoe for the New Year slogan. Can�t think why the vendor didn�t notice this. But it partially answers the mystery � it�s something for the New Year. And judging by the obvious wear to the mug sides it has been in regular use � perhaps passed round a drunken crowd in the early hours of January 1st for some decades? It polishes up rather well � and the form and quality of the decoration (usual botanically accurate branches and leaves but botanically inaccurate berries placed between leaves) is obvious. But this isn�t a particularly fine example of the type � compare it with this pic of a much classier version, also recently advertised on Ebay. This has a maker’s name ‘Jules Brateau’ and a date of c 1900. This �posher� one had a reserve of several �100, but I picked up my version for just �30 � I think I prefer mine, not �cos it was cheaper but because it�s obviously been used. 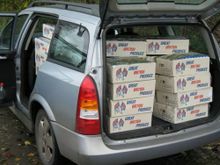 A TEME delivery – 50 boxes of mistletoe from Tenbury to Hungerford. Now I’ve had a fair bit of mistletoe in the car before – but never this much – all seats folded down, even some in the front passenger footwell. I’ve been too busy for audio editing – but do have lots of material to upload – so there’ll be some podcasting soon. New York, New York! � it�s a wonderful town! Or so I�m told � I�ve never been, but did make a virtual trip over to monitor some more mistletoe art nouveau auctions on Friday. I had my eye on five items, all 1920s Lalique designs, and all (to me) unaffordable. 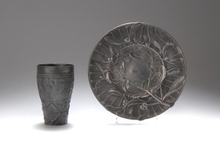 But an interesting set, and a curious comparison to those in the Bonhams auction in London on Wednesday. 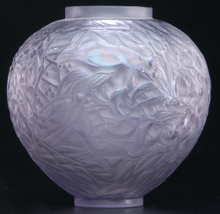 There were three Lalique Gui vases � all the same moulding, but each in a different colour � 259 was described as Plum, and estimated at $3 to $4K � it sold for $3500 after just 2 bids. 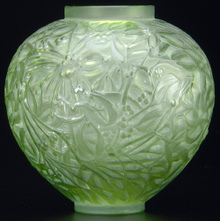 Number 260, described as Pea Green (not a description Rene Lalique would have liked I�m sure) estimated at $2 to $3K sold at for $1900 after just one bid. Number 403 described as �cased jade green� (whatever that means) was obviously considered a real rarity � it was estimated at $7 to $9K but remained unsold, after one bid of $3500. 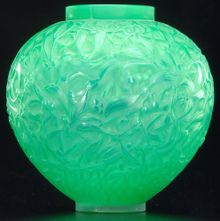 There was also a classic Lalique Gui Bowl � in �opalescent mint green�. Estimated at $800 to $1200K this seemed to still be unsold after three bids only amounted to $400. And then there was this rather odd thing � an item I�ve never seen before, described as a Lalique jewelry pendant, in a Gui pattern and in a �red amber� colour. 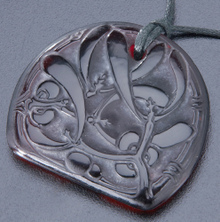 It looks very like some of the modern Lalique Christmas pendants (usually round medallions) but claims to be original 1920s material. This item closed at $475 (the estimate was $700-$900). How do these compare to the London auction? Let�s halve the dollar prices to give a rough indication in sterling � which makes the Plum vase �1750, the Pea Green Vase �950 and the Jade Green one unsold at �1750, and holding out for at least �3500. The price differences between colours suggest a lot rides on the colour � Jade Green presumably being rare. 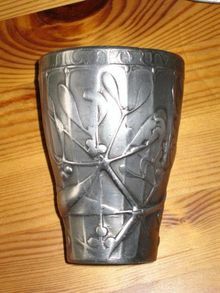 The London Druides Vase (a different mistletoe design) fetched only �480 – which suggests a better market in NY? Sterling equivalent � unsold at �200, holding out for at least �400. 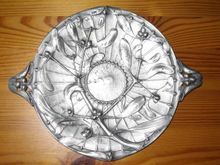 The similar London bowl was also unsold – and had also aimed for �400.